"Lead with your ears, follow up with your tongue, and let anger straggle along in the rear." What a gorgeous word picture! The Message is the version I like for hearing things in fresh, poetic and often very practical language. As the translator says, "You are going to come across words and sentences that stab you awake to a beauty and hope that will connect you with your real life" (A11). Though I don't know about being "stabbed" I definitely feel my soul awakening when I read it, and I've jotted down many of Peterson's wordings in my journal. 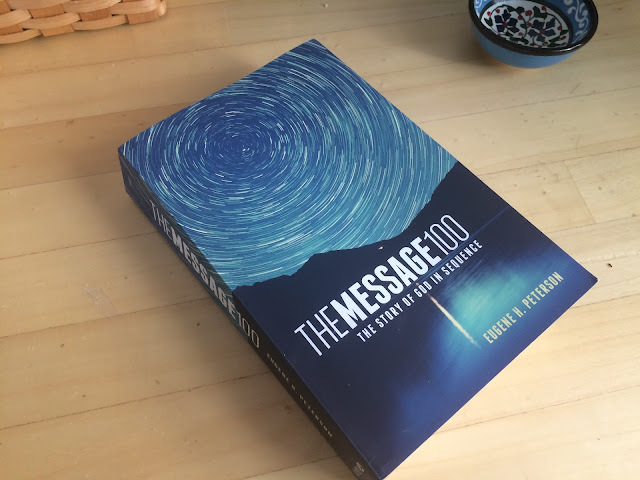 There are a bunch of iterations of The Message available; The Message 100 is arranged into 100 readings of about 12-15 pages each, mostly in the order in which the books were written. Peterson offers a brief overview of the main themes contained in each reading. 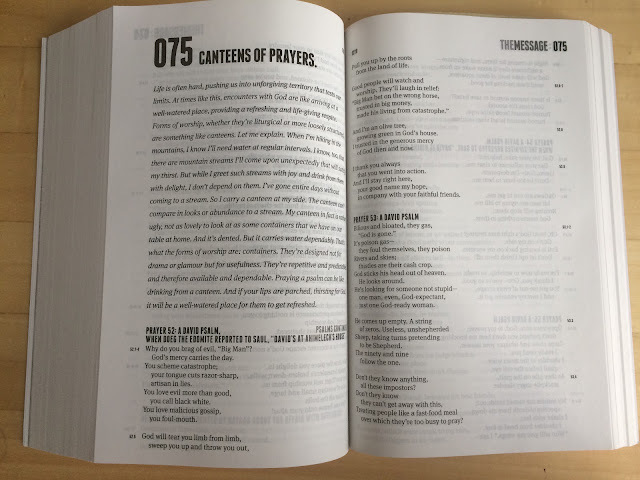 If you have a goal to just immerse yourself in the word, The Message 100 is good for that. It took me a little while to figure it out, but there is a handy index at the very back that lists each of the 100 readings and it's contents. I think a table of contents in the beginning might have made more sense, but as this version has a foreword by Bono, a preface, an introduction, then another mini-preface, I can see why the editors chose to place it at the end. Overall, this is a great reading bible. The layout and font are clean and easy on the eyes. The pages are thin and smooth, but not onion-skin fragile. And, as you can see from the picture, the paperback lies flat when open to most any page beyond 80. I'm not sure about you, but sometimes these little details can aid me in reading longer and with greater gusto.